1 And it came to pass in those days that a decree went out from Caesar Augustus that all the world should be registered. 2 This census first took place while Quirinius was governing Syria. 3 So all went to be registered, everyone to his own city. 4 Joseph also went up from Galilee, out of the city of Nazareth, into Judea, to the city of David, which is called Bethlehem, because he was of the house and lineage of David, 5 to be registered with Mary, his betrothed wife, who was with child. 6 So it was, that while they were there, the days were completed for her to be delivered. 7 And she brought forth her firstborn Son, and wrapped Him in swaddling cloths, and laid Him in a manger, because there was no room for them in the inn. 8 Now there were in the same country shepherds living out in the fields, keeping watch over their flock by night. 9 And behold, an angel of the Lord stood before them, and the glory of the Lord shone around them, and they were greatly afraid. 10 Then the angel said to them, “Do not be afraid, for behold, I bring you good tidings of great joy which will be to all people. 11 For there is born to you this day in the city of David a Savior, who is Christ the Lord. 12 And this will be the sign to you: You will find a Babe wrapped in swaddling cloths, lying in a manger.” 13 And suddenly there was with the angel a multitude of the heavenly host praising God and saying: 14 “Glory to God in the highest, And on earth peace, goodwill toward men!” 15 So it was, when the angels had gone away from them into heaven, that the shepherds said to one another, “Let us now go to Bethlehem and see this thing that has come to pass, which the Lord has made known to us.” 16 And they came with haste and found Mary and Joseph, and the Babe lying in a manger. 17 Now when they had seen Him, they made widely known the saying which was told them concerning this Child. 18 And all those who heard it marveled at those things which were told them by the shepherds. 19 But Mary kept all these things and pondered them in her heart. 20 Then the shepherds returned, glorifying and praising God for all the things that they had heard and seen, as it was told them. 1 Now after Jesus was born in Bethlehem of Judea in the days of Herod the king, behold, wise men from the East came to Jerusalem, 2 saying, “Where is He who has been born King of the Jews? For we have seen His star in the East and have come to worship Him.” 3 When Herod the king heard this, he was troubled, and all Jerusalem with him. 4 And when he had gathered all the chief priests and scribes of the people together, he inquired of them where the Christ was to be born. 5 So they said to him, “In Bethlehem of Judea, for thus it is written by the prophet: 6 ‘But you, Bethlehem, in the land of Judah, Are not the least among the rulers of Judah; For out of you shall come a Ruler Who will shepherd My people Israel.’ ” 7 Then Herod, when he had secretly called the wise men, determined from them what time the star appeared. 8 And he sent them to Bethlehem and said, “Go and search carefully for the young Child, and when you have found Him, bring back word to me, that I may come and worship Him also.” 9 When they heard the king, they departed; and behold, the star which they had seen in the East went before them, till it came and stood over where the young Child was. 10 When they saw the star, they rejoiced with exceedingly great joy. 11 And when they had come into the house, they saw the young Child with Mary His mother, and fell down and worshiped Him. And when they had opened their treasures, they presented gifts to Him: gold, frankincense, and myrrh. 12 Then, being divinely warned in a dream that they should not return to Herod, they departed for their own country another way. How time flies! I usually try to get in two or three extra posts between Thanksgiving and Christmas, but this year time just flew past. I just finished posting a series of blogs on how to simplify your Christmas or how to make it more meaningful for you. Therefore, I thought I’d give a simple Christmas message and recount the Christmas story. What?! Change Christmas?! . . . Can I? Was Christmas 2012 everything you hoped it would be? Did you do something that once was fun but turned out to be more trouble than it was worth? Has your family situation changed so that the Christmas celebrations that you once knew are no longer practical or even possible? My family loves Christmas and love celebrating Christmas. If I had my way we would live in a house with a large living room and dining room decorated with lots of Christmas greens and lights. A large Christmas tree would stand near the fireplace. Guess what! We don’t have a large house or even a large living room. A small apartment-size tree makes our cramped living room even smaller. At this time decorating a large tree is not possible for us, but we don’t dwell on what we can’t have. Instead we gather together as a family and together decorate our tree and enjoy what we did all season long. When my oldest daughter was younger (she’s 18 now) we set aside one Saturday in December to bake cookies. Everyone in the family picked their favorite cookies (there were only 5 of us then), and we baked. Each child helped me make their favorite cookies. By the end of the day we made double batches of at least 6 or 7 different kinds of cookies. As our family grew (there are 9 of us now) that day became a chore instead of fun. I began dreading baking day. Two years ago I decided we needed to change this tradition a little. We put together a list of cookies we wanted for Christmas. We still made 5 or 6 different kinds of cookies, but we changed how we did them. My daughter loves Choco-Mint Snowtops. She made them during the week while I was at work. We also cut down the amount of cookies we made from 2 batches to just 1 batch. One last change we made was to use … oh, horrors … say it ain’t so … refrigerated, store-bought cookie dough. Now the day that became a dreaded tradition is fun again. About 3 years ago we decided that we wanted to make our Christmas breakfast a special meal to look forward to in addition to our Christmas dinner. We looked at recipes for breakfast casseroles. My wife made sure they didn’t have a bread base. She doesn’t care for them. We found 2 recipes that looked delicious. The first time we made 1 of each. The next year, since we knew which one we preferred, we made just 1 recipe. That’s one of our newest family Christmas traditions. For us Christmas is more than music, lights, presents, and food. It is remembering the reason for the season, Jesus, whose birthday we celebrate every Christmas. Several years ago we started gathering a number of advent books to read during Advent. 3 of the books are stories of characters, children, who may have played a part in the Christmas story. They are fiction stories, but we enjoy the stories seeing how the events in the lives of the children in the stories intertwine with the characters we all know of the Biblical Christmas story. The fourth book contains inspirational readings, passages of the Bible to read, and songs to sing as we anticipate and prepare to celebrate the birth of Jesus our Savior. This is another family tradition that our children look forward to each Christmas season. These are just some of the ways our Christmas celebration has changed over the years. What about your Christmas traditions? I would love to hear about your Christmas traditions that changed over the years. Perhaps you no longer use them in your celebrations. Perhaps you added them to enhance your enjoyment of Christmas. Whatever they are I’d love to hear about them. Perhaps I can add them to our Christmas celebration. Starting next month I’ll be sharing a series of blogs called How to Have the Christmas You Always Wanted based on the book/seminar series Uplug the Christmas Machine by Jo Robinson and Jean Coppock Staeheli. You won’t want to miss this series. Invite someone read them with you. 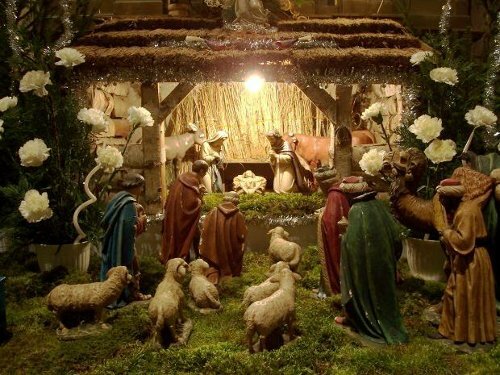 Many people use the fact that the shepherd were in the fields watching their sheep as proof that Jesus could not have been born on December 25. Actually, since we are never told why the shepherds were in the fields that night, any reason proffered is pure speculation. Why were they in the fields at night instead of in the sheep folds? We are never told why. Perhaps it was because of all the Roman soldiers in the area. The Roman soldiers were known to take by force what they wanted so perhaps the shepherds were out in the fields to keep the sheep away from the soldiers. In that case they might have been in the fields with their sheep cold or not. At any rate the shepherds were in the fields watching the sheep. Each day was spent making sure the sheep got the food and water they needed; each night watching the sheep sleep undisturbed by thieves or marauding beasts. One day ran into the next with very little change to the routine. Next week at this time I’ll be out of a job. Hopefully I’ll have another job before Christmas. If I don’t we may have a “lean” Christmas this year, that is a Christmas with few gifts. We may be looking at how each one of us can give gifts of love that don’t cost much if any money. My oldest daughter is already doing this. For the last couple years she’s been doing crochet projects and cross stitch projects to give as Christmas gifts. I’ve given coupon books to my children with fun things or projects we could do together. We’ve also given baked goods as Christmas gifts. We may not have a lot to do with this Christmas, but we WILL be together. We will be celebrating Christmas as a family. We’ll play board games together. We’ll play Wii games together. We’ll laugh together. We’ll enjoy each other. We’ll also be remembering that we’re celebrating the birthday of Jesus Christ. I don’t know how that celebration will look, perhaps we’ll have a birthday cake. I don’t know. One thing I do know is that we’ll be reading the Christmas story from the Bible. We do that every year. Here’s the recipe of some cookies that we enjoy at Christmastime. Perhaps you’ll like them, too. inch balls; roll in powdered sugar. Place on ungreased baking sheets. racks. Makes 3 dozen cookies.